East Timor Religious Outreach demonstration at the Indonesian Consulate in San Francisco, CA in the 1990s. Photographer unknown. Thirteen years ago today — August 30, 1999 — the people of East Timor took to the polls in a United Nations-sponsored referendum on the future of their country, with over 80 percent of this small Pacific nation voting for independence from Indonesia. In the run up to the vote, international observers had witnessed shootings, beatings and a climate of intimidation aimed at pro-independence Timorese and fomented by paramilitaries supported by the Indonesian military. After the overwhelming vote favoring freedom, the Indonesian violence dramatically escalated. Many East Timorese were killed, with as many as 500,000 displaced. This calamitous destruction galvanized international outrage, and within a few weeks a U.N.-mandated International Force for East Timor was deployed, with the task of restoring peace and overseeing the country’s transition to independence. East Timor became an internationally recognized, independent nation on May 20, 2002. Controlled by the Portuguese since the 16th century and rich in timber and offshore natural gas, East Timor had been decolonized in 1975, only to be promptly invaded and occupied by Indonesia in a military operation green-lighted by U.S. President Gerald Ford and his Secretary of State, Henry Kissinger. A brutal counter-insurgency campaign was waged for decades against the armed resistance that sprang up after the invasion. Though U.N. resolutions condemned Indonesia’s land grab and the massive violence that ensued, Western governments did nothing to challenge this arrangement. The first major protest occurred in November 1988, when Pope John Paul II was invited by [Indonesian] President Suharto to [East Timor’s capital] Dili, an act meant to bestow further legitimacy on the forced annexation. During the pope’s mass, which was attended by thousands, a group of East Timorese youths ran up to the altar and began shouting pro-independence slogans and unfurled banners calling on Indonesian forces to leave. The demonstration, covered by the media, embarrassed Indonesia, showed the face of East Timorese opposition to the outside world, and helped lower the levels of fear among the East Timorese. Three years later, the Indonesian military opened fire on a pro-independence procession to the Santa Cruz cemetery in Dili, killing 271 participants. Unlike past atrocities, this one was filmed and photographed by Western journalists. Amy Goodman and Alain Nairn, who were badly beaten during the military attack, managed to get the story out. This event helped spark the emergence of an international solidarity movement, including the founding of the East Timor Action Network. In 1994 my friend and colleague Rev. John Chamberlin visited East Timor and made an irrevocable commitment to work for its freedom. A United Methodist minister based in San Francisco, California, Chamberlin created East Timor Religious Outreach, and cajoled a handful of us to help organize a series of marches and nonviolent civil disobedience actions at the Indonesian consulate beginning in 1994 and carrying on through the 1990s. These were small but heartfelt protests, vigils and prayer services held at the consulate’s modern building a stone’s throw from Fisherman’s Wharf. Our actions drew a lot of notice from the streams of tourists headed up Columbus Avenue toward North Beach, especially when a few of us would scale the gate and, ensconced in the doorway, proceed with our speeches until we were handcuffed and led away by the police. Eventually, we were invited to join the National Council of Churches East Timor Task Force, where we helped develop an organizing plan for alerting and mobilizing religious communities to the Timorese struggle. This included staging a national strategy retreat for religious leadership, organizing delegations of clergy to visit East Timor, and attempting to build momentum for a shift in U.S. policy. Most of the time, though, it felt like no progress was being made. And we in the U.S. were not the only ones who felt this. At one point José Ramos-Horta (the de facto East Timorese ambassador who traveled the world pleading his country’s case and seeking international support) came to town and, in a meeting he had with a couple of us, shared his personal sense that things had bogged down. He couldn’t see a way forward. He would continue the work, but nothing seemed to be breaking. We got to talking about a model that I had found helpful in organizing — Bill Moyer’s “Eight Stages of a Successful Social Movement” — but the thickness of the fog was impervious to models, even those that might hint at a hidden momentum feeding on all that had taken place since the beginning of the struggle. There comes a point when you enter a nowhere land, where the future is utterly unclear. In spite of this impenetrable mystery, though, you carry on — which is what Ramos-Horta and many others did. Then, unexpectedly, the skies began to clear. Ramos-Horta and Catholic Bishop Carlos Filipe Ximenes Belo were awarded the Nobel Peace Prize in 1996, drawing new international attention to the conflict. Next, a largely nonviolent pro-democracy movement brought regime change in Indonesia in 1998. The internal and international pressures for a shift by Indonesia on East Timor accelerated, which led to the 1999 referendum. During this post-referendum violence, [long-time Timorese leader Kay Xanana] Gusmão called on the FALANTIL guerrillas to remain inside their cantonments and not to resist with military force. Gusmão later defended this decision, saying, “We did not want to be drawn into their game and their orchestration of violence in a civil war… We never expected such a dimension in the rampage that followed.” On September 14, 2000, the UN Security Council voted unanimously to authorize an Australian-led international force for East Timor. There is no end to the challenges of independence, including the monumental problems of poverty, political divisions, injustice, and violence, which Ramos-Horta (who has served as East Timor’s prime minister and president) experienced directly when he survived an assassination attempt in 2008. As we are learning, successful nonviolent people-power movements that end dictatorships and occupations do not automatically create thriving societies. Nonviolent change is messy. Hence the need for persistence and its role in dispelling the fog. Ramos-Horta has practiced this kind of persistence, and so have people like John Chamberlin, who has been back to East Timor almost every year since his first trip in the early 1990s. Though he will be retiring officially from the ministry next year, he tells me that his work for East Timor will go on and on. We are living in a special time that is disclosing many lessons concerning the power, techniques and gumption that people-power movements for monumental change require, from the Filipino movement that toppled Marcos to the Arab Spring that brought down dictatorships in Tunisia and Egypt. There are many keys to the effectiveness of this nonviolent option, including a stubborn relentlessness even when the feedback loop runs dry. 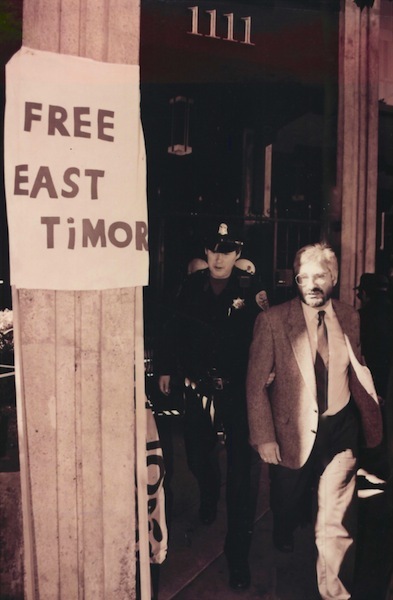 East Timor is yet another case of this persistent and harrowing journey that, like all the others, offers us clues for taking action as we move forward into the unknown future of nonviolent transformation. With reference to the above post i would like to give my views and i mean it is not agreeable in the case of Pakistan to have refrendoms in different provinces to ask them wheather they want to stay with Pakistan or not the east timor problem was a different issue and in fact the super powers have always tried to break the countries into small pieces for their benefit. I have question here why does america or england break away their country into different small independent states because they have the same problems over their also why only they suggest the other nations to do so, very soon they will have to face the same situation themselves because it is said that the history repeats itself so eyes must be opened and the propaganda be stopped for others. You seem to believe that countries dividing into smaller countries is not just bad for Pakistan….but bad for all countries in all circumstances. Therefore I presume you believe that Pakistan and Bangladesh should be back together….or for that matter, India/Pakistan/Bangladesh should re-unite? This seems reasonable to me. Some countries have amiably “divorced” including Norway/Sweden and Czech and Slovak. Countries splitting apart can be a good thing and done without violence or hatred. The UK has a referendum on Scotland soon that may “split” Britain. Whether it is good or bad is really up to the peoples involved. We would hope that whether they are 1 country or 2 that they don’t kill each other. Ultimately, countries and peoples need to get along with each other because they are neighbors for the next thousand years, because our ecological, economic, cultural interconnections are deep and increasingly our survival on earth is one based upon interdependence. Undoubtedly, big political powers use divide and rule tactics, particularly nationalistic passions, to great effect. What else is new. But don’t be tricked…while the masses may be focused on nationalistic or religious squabbles, the multi-national corporations are quietly eating our lunch. Do you think Citicorp, McDonalds, Siemens, or Nissan cares how many countries we are? Great to see some coverage of TL on WNV. While the pressure placed on Indonesia and other international actors throughout the occupation was, indeed, very important, I think that the catalytic role of the Asian financial crisis on the democratic transition in Indonesia, and the subsequent decision – made under financial pressure – to allow the referendum to go forward, should be emphasised. As always, politics and economics go hand in hand.